An excellent double hung, triple track storm/screen window. Tough, handsome, and durable, it is made under high standards of quality and workmanship. 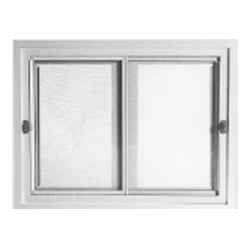 At a competitive price, it is a superior window - an excellent value that will reduce your home's energy consumption. Electrostatically applied paint is bonded to the metal - resists fading, cracking, peeling, blistering, and flaking. Available in White, Bronze, and Tan. Aluminum screen wire is standard in natural finish. Charcoal aluminum and fiberglass screens are optional. Frame and sash are of T6063-T6 aluminum alloy extrusions with typical wall thicknesses of .045 inch for strong, maintenance free operation. Weatherstripping gives virtually draft free performance; reduces rattles too. Marine glazing - no glass to metal contact. Glass fits securely in a water tight vinyl channel. Tight sealing interlocking meeting rails on all three inserts give protection from cold, wind, and insects. Advanced engineering features make operation smooth and easy. Sill drainage slots help prevent sill rot. Closed sill for easy cleaning. Stabilizer bar is of fully extruded aluminum for strength. Screwed corner glass inserts for easy reglazing. For an excellent, durable, smooth operating double slide storm slider, choose the Yeoman. Glass inserts glide easily on rollers. Frames formed of rugged T6063-T6 extruded aluminum with .045 inch wall thickness. Hollow sill for strength and rigidity. Strong double H shaped mullion. Marine glazed in vinyl channel. Aluminum wire is standard. Charcoal aluminum and fiberglass are optional. Screens are spring loaded for snug fit. Screens are confined in metal channels on three sides to help prevent bug infiltration. Screens and inserts install and remove easily. 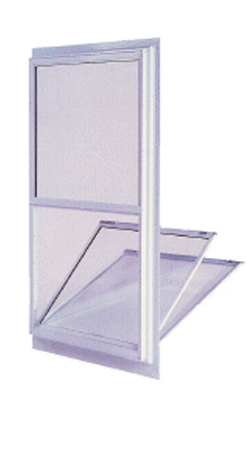 Available in three section slider with center picture and two sliding flankers with screens.